We encounter obstacles and “hit walls” in many parts of our lives, running is no different. Well, today was not normal for me. I hit my wall right at the beginning of the run. Yeah I was excited Hoda got us on our way and that I knew the route inside and out, but I was battling many mental demons this morning – mostly because of how my body was feeling physically. First, I knew I didn’t eat enough this week, particularly yesterday. I blame that on the workshop I attended and the allergy problems I’ve been having this week. Who feels like eating when you have constant nasal drainage, you’re perpetually sneezing, and your head and body just hurt? I don’t. So I tried to drink lots of vitamin water, camomile tea, and water – but, not good enough. Second, good luck running if you haven’t had a good sleep in three nights due to the nasal drainage and coughing. Third, I was worried about my IT bands. I was afraid of having horrible pain like I did last week in DC, so this week I bought a compression brace for my knee and wore it most days. I also bought a foam roller to roll out my legs. Yesterday I even picked up some K tape and watched a video to learn how to apply it. So last night I taped up one knee and taped the other this morning. I put my brace on my right knee, ate my usual half bagel with peanut butter, drank some vitamin water and got ready. As I walked to the park I started feeling a little better, getting my body moving. Then once at the park I started absorbing the energy of the event – a few thousand women ready to run, flowers blooming and trees budding! As I lined up in the corral and walked toward the start line, I just didn’t feel like running. My legs felt fine, my body felt reasonable, but my mind was already telling me that I didn’t want to. The whole first six mile loop, my internal monologue was me telling myself to walk after the first loop. I didn’t want to run past that same spot an hour later. I just didn’t want to. My thoughts were barely about my knee not hurting (yay! ), or that I wasn’t sneezing or coughing – I just wanted to go home. But as I completed that first loop, and came around location of the finish line, my wall began to disappear. I knew at that point, there would be no walking, there would be less mind games. Maybe I would stop for some Gatorade or a pee, but that’s it. Physically I was still okay at that point, and mentally – finally getting past the brick wall of the first six miles. So I kept running, grabbed some Gatorade at mile nine and peed at mile 11 – finishing the run in decent time, strangely. 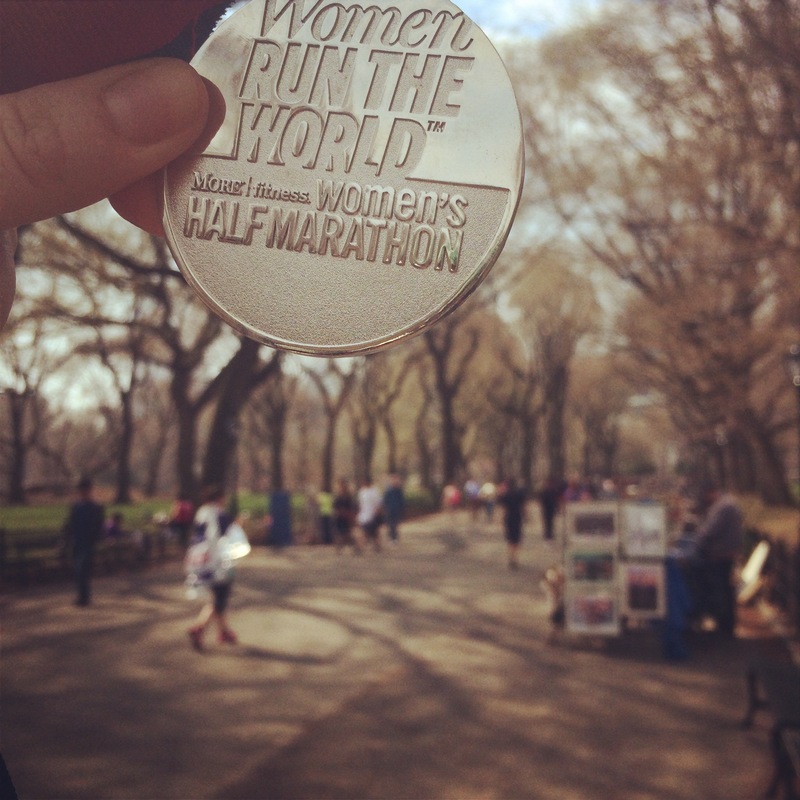 Once I crossed the finish line, got my medal and apple, and headed for home – the journey home was hard. Hard to walk because my left knee decided to pain me and hard mentally because I just wanted to be in my bath tub! That was the longest walk home but, once again, I did it. Yes with lots of complaints, I apologize, I know life could be worse. All those complaints though, are always worth the satisfaction of the finish. I use K tape for my shoulder in hockey. It makes such a difference! Seems like it! Who knew!